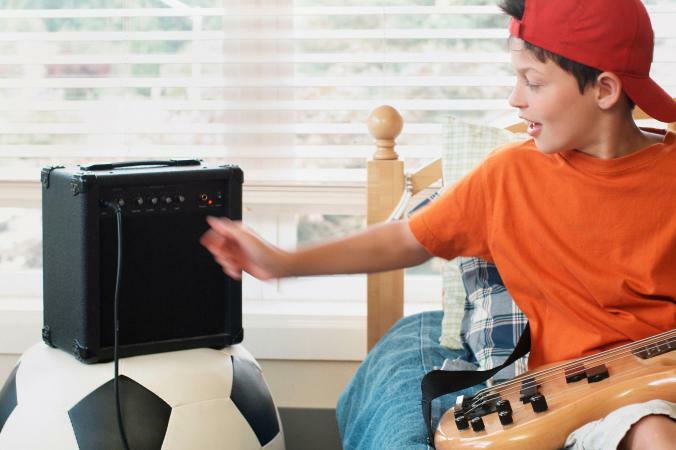 If you're just starting on the guitar or if you're on a tight budget, purchasing a cheap guitar amp can be the way to go. 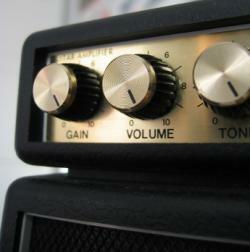 Many cheap guitar amps are great for rehearsals and playing in small venues. However, to get good value for your money, it's crucial to prioritize what you need from your amp before you start shopping. Cheap guitar amplifiers aren't such a good deal when they don't do the job you need them to do. These tips will help you prioritize what you're looking for. Keep in mind that most mid-size quality amps start around $300 and large combo amps and amp heads with cabinets for the largest gigs easily start at around $1,000. Any good sounding amp under $300 would be considered cheap. Most of the examples below are under $100, yet they sound amazing for their small size and rock-bottom cost. The power of an amp can be determined by the wattage of the amp. For playing at home, an amp that has anywhere from 1 to 10 watts (called a mini-amp) will do the job, but keep in mind that although these are the lightest weight amps you can find, they're usually not ideal for more than personal practicing or home recording. Something between 10 and 30 watts is ideal. Make sure your amp has at least a 10-inch speaker. This will ensure the rest of the band can hear you playing. In professional bands that have serious gigs, there will often be something akin to a dress rehearsal. In these situations, the guitarist plays with the gear they plan to use in the live gig. The goal is to fine-tune everything exactly how the bands wants it to be for the gig. This will require more powerful amplifiers like the ones mentioned next. Combo amps, either 1x12" or 2x12," with at least 50 watts of power, will do the trick for playing live. Granted, you're not going to rock out in Madison Square Garden with something this size, but this is as small as you can go and still have an amp that will serve you well on the club scene. Where do you fit in this picture? Figure out which amp is going to meet your needs, and then you will be ready for cheap amp shopping. The examples below follow the four playing situations mentioned above. Fender's '57 Mini-Twin works hard to deliver a wonderful vintage quality with its look and sound. Its exterior is made with genuine tweed, and as you will notice in its video, the amp has gorgeous clean and crunch for such a small amp. The crunchy clean sounds like a Chuck Berry record, and the normal clean sounds like it came from a classic rock album. This amp is vintage Fender-style through and through. The Mini Twin costs about $40 and it is worth every penny. At about $80, the Vox Pathfinder 10 amp costs less than some guitar accessories, yet it delivers a quality tone at 10 watts with a 6.5-inch speaker. It has a shimmering clear clean sound, and its distortion is the patented creamy crunch that Vox loves to deliver. It only weighs 10 pounds, and it has a phone jack/line out for practice or recording-a perfect amp for home use. Marshall's MG15CF 15 watt amp takes the hallowed Marshall sound and tradition and cleverly shrinks it into a 15 x 14.9 x 8-inch amplifier that weighs 16 lbs, has 15 watts, and a 1 x 8-inch speaker. This amp is potentially loud enough to work well in a band rehearsal depending on the band and their volume. The MG15CF costs a stunningly low price of about $100. This is stunning because 1) it's a Marshall, and 2) it has a built-in effects processor with quality effects, yet the whole thing costs less than one expensive guitar pedal. The legendary Fender Champion 40, though it costs more than all the amps above, brings a powerful 40 watts and a 12-inch speaker to the table that can hold its own in most band rehearsals and many loud live gigs. The best part: it has the classic Fender voicing that is timeless and versatile, able to slide into any genre of music convincingly. The Champion 40 costs about $180, but this is ridiculously cheap considering it's one of Fender's legendary amps and it has a built-in special effects processor. The same that was said of the Marshall can be said of this amp: you're getting a world-class amplifier for half of what you'd pay for, say, an expensive Boss Digital Delay pedal. The powerful Randall RG80 has 80 watts of deafening volume, twice as loud as any of the amps above, and it costs about $250, which is still considered quite cheap in the bigger picture of guitar amplifiers. It's no surprise Randall is responsible for this beast of an amp. Randall has a stellar reputation among metal enthusiasts, but this gig-ready amp is surprisingly versatile in tone and can be used in any genre. Besides being loud enough for hard rock gigs, the real strength of this cheap but superb guitar amp is its versatility. In the video below, for example, the player riffs on some blues in the beginning, and it sounds just as superb as Randall's metal sound (though you will need to turn the amp's massive gain way down to get these other genre sounds working). To be clear, you have to be a fan of the Randall sound. It has a distinct solid state modern tone to it. If you lean more toward vintage-sounding tones like Fender or Marshall tubes, this amp may not be the sound for you. But if you don't mind the solid state sound, the RG80 gives you fantastic quality for a low cost. The life of a guitarist is a marathon not a sprint. Whether you're a professional or a hobbyist, you will purchase multiple amps throughout your lifetime as you play in different bands, settings or living situations. Developing a knack for smart amp shopping now will pay off throughout all of these phases.